This reproduction of the beloved Shirley Temple doll is done to recreate the childhood charm of America's favorite little girl. Shirley Temple remains the best-known child Hollywood movie star of all time and the Shirley Temple doll continues to be the champion of the doll industry. The first Shirley was created in 1934 and have been avidly collected along with hundreds of costumes inspired by Shirley's roles in 57 films between 1931 and 1949. Stephanie Sowatzka has created an exquisite reproduction of this American favorite. Shirley is 24" and is all composition. Stephanie takes great pride in this, her favorite reproduction. Shirley's rocker eyes are installed by Stephanie in the Sowatzka's Dolls and Collectibles doll studio. 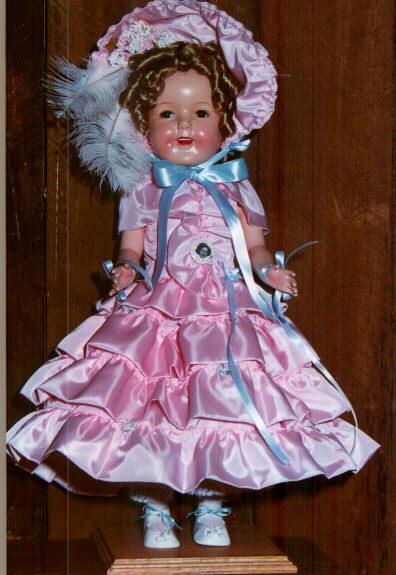 The artwork is copied directly from an original Shirley Temple doll. The doll is dressed in replicas of the original costumes, and are made for each individual doll. This wonderful creation is limited to 50. Each doll is signed and numbered by the artist.